Description: A flight of Aggressor F-15 Eagles and F-16 Fighting Falcons fly in formation June 5 over the Nevada Test and Training Range. 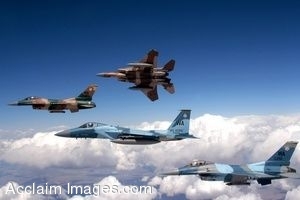 The jets are assigned to the 64th and 65th Aggressor squadrons at Nellis Air Force Base, Nev. The Aggressor mission is to prepare the combat air forces, joint and allied aircrews for tomorrow's victories with challenging and realistic threat replication, training, academics and feedback. (U.S. Air Force photo/Master Sgt. Kevin J. Gruenwald). Clipart photograph by Department of Defense Public Domain.